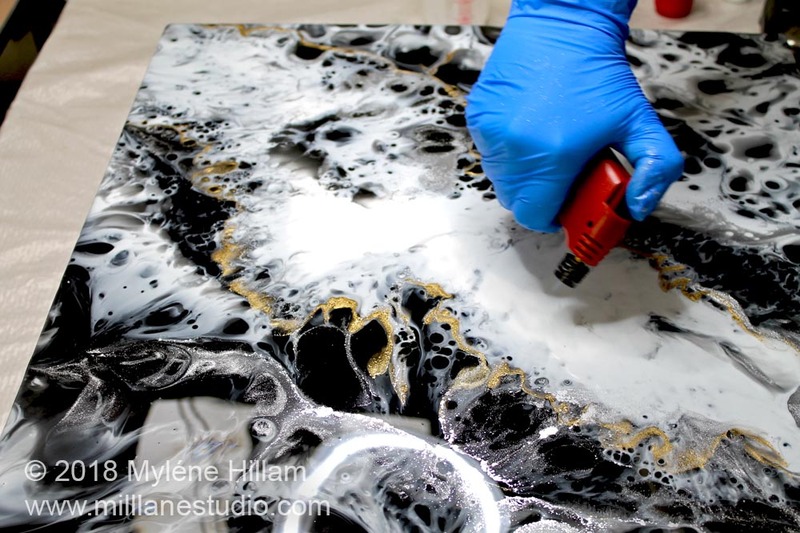 Resin art is a fun way to create a piece of contemporary art that you can proudly display in your home. 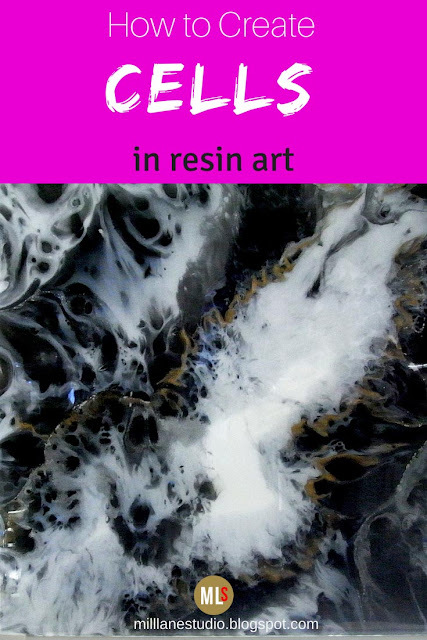 And it's not difficult to get started with pouring resin. 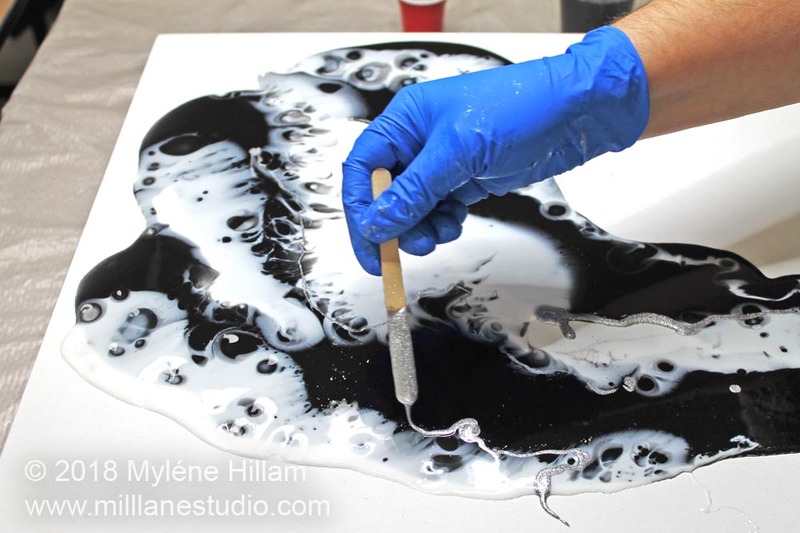 If you've been admiring all the incredible fluid art pieces on Pinterest and want to know how it's done, then this tutorial is for you. It shows you a simple technique for creating resin cells in your artwork. The black and white colour scheme makes the cells even more dramatic! Before you get underway, protect your work surface with a plastic painter's drop sheet. 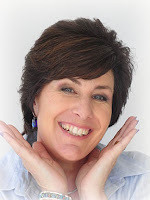 Resin is really sticky stuff and you don't want to get it on you. Wear goggles and gloves at all times and work in a well ventilated area. Elevate the art panel on some cups and then level the canvas. 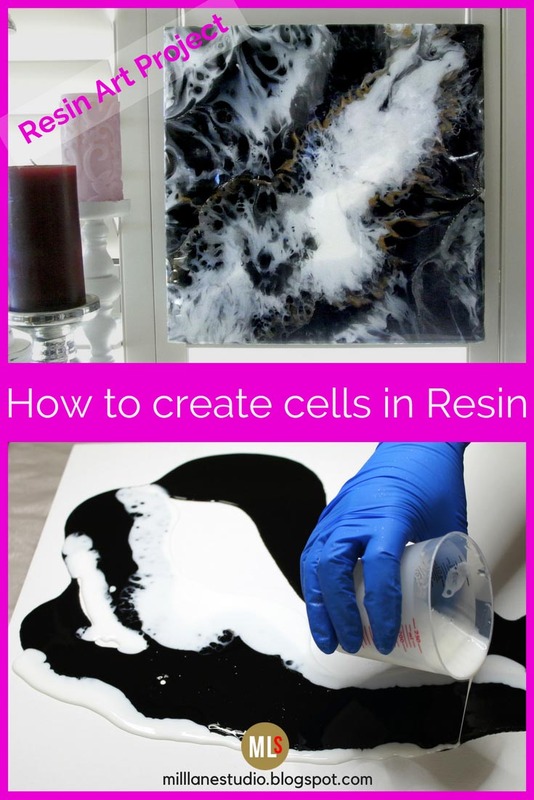 Resin will always find the low point so if your canvas is not level, the resin will flow in that direction, which can spoil your artwork. Before you begin, tape the back of the art panel or painting panel with painter's tape and burnish the edges. This will make it easier to remove any resin that overflows. Measure out 125mls (4oz) of Part A and 125mls (4oz) of Part B of EnviroTex Lite in the same cup. 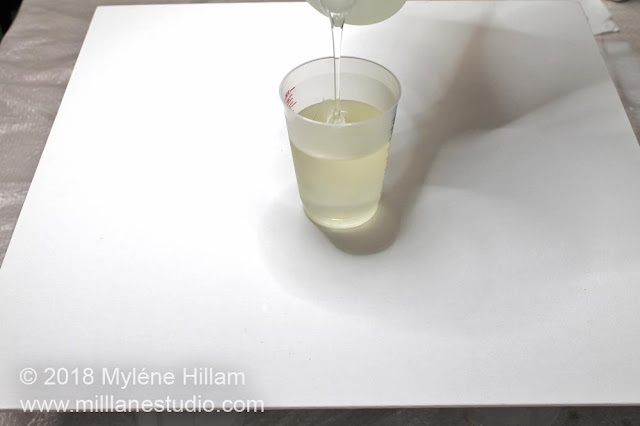 Mix the resin thoroughly, following the mixing instructions included in the resin kit. 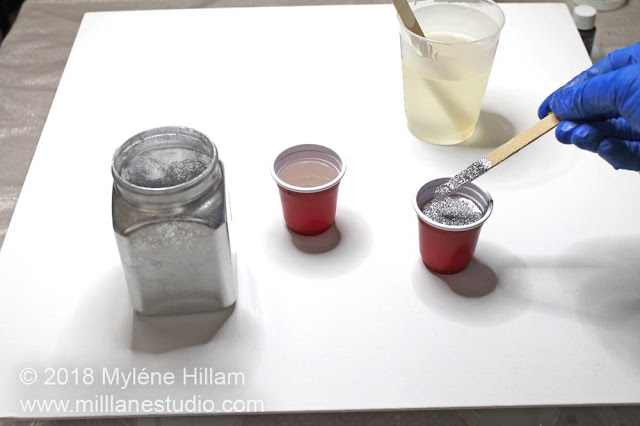 Pour 30mls (1oz) of resin into each of two small cups. 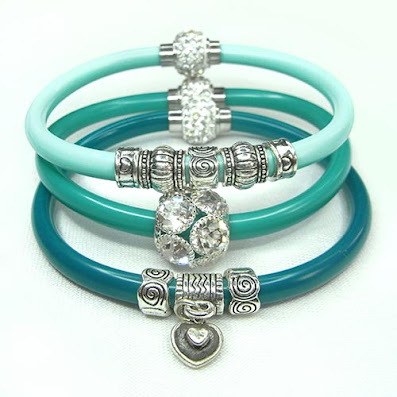 Colour one with silver and one with gold. Use enough powder to make them opaque. Colour the remaining resin with enough black pigment to make it opaque. Pour the black resin across the art panel in large bands of colour. Keep some large open spaces for the white resin. The magic ingredient for creating cells is demethicone. 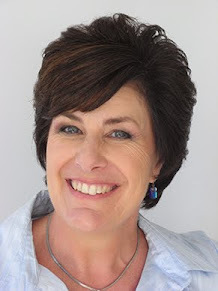 It behaves like a repellent and disperses the resin. 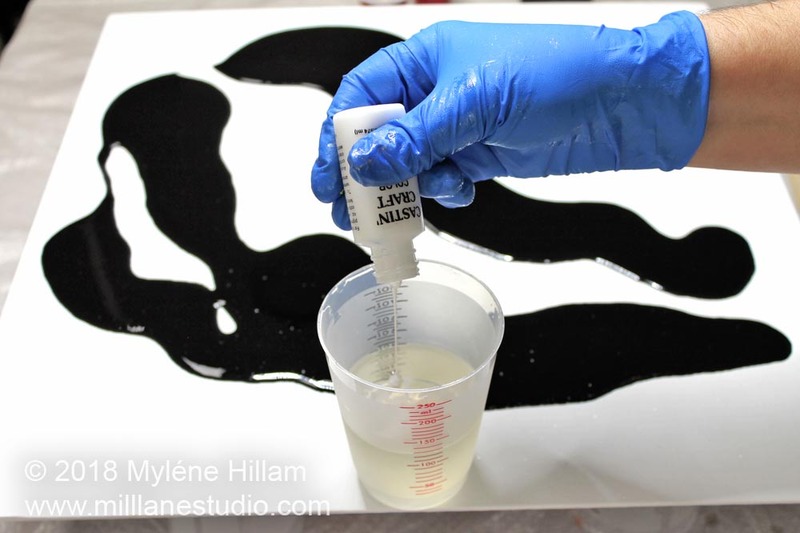 Add 5 drops of the dispersion media into the white resin and stir through very lightly. The amount of stirring you do actually determines the size of the cells. 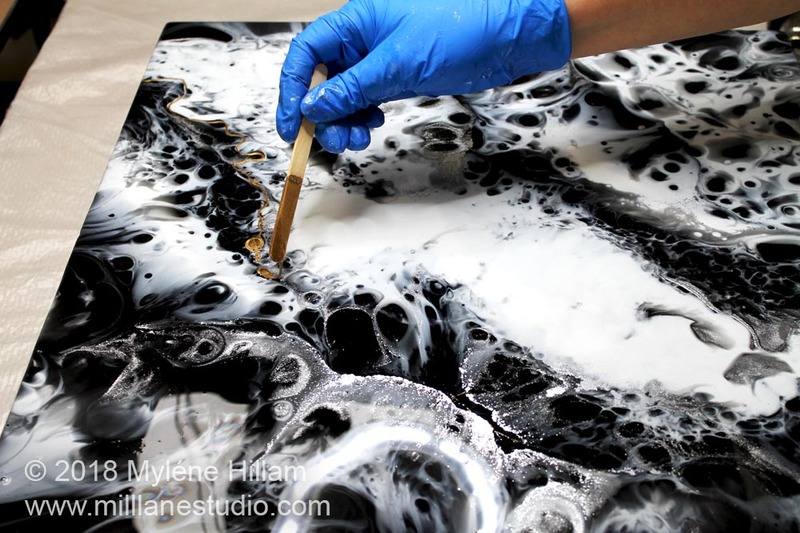 Pour the white resin in the open spaces on the canvas alongside the black. You will see cells developing where the two colours meet. 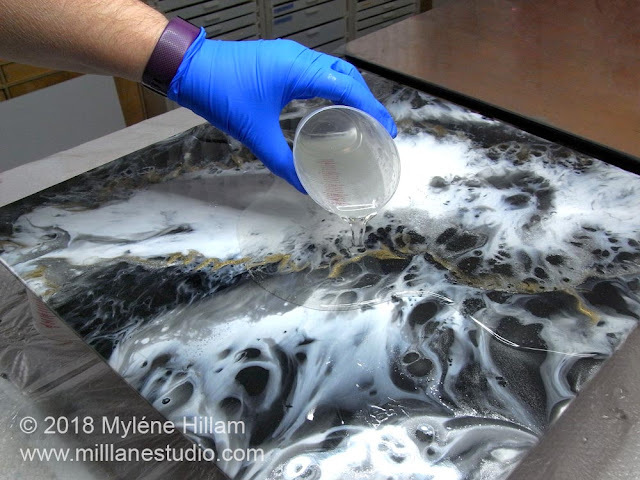 If the cells don't begin to form, pick up the painting with your gloved hands and tilt the panel just enough so that the resin begins to move. This should open up the cells. 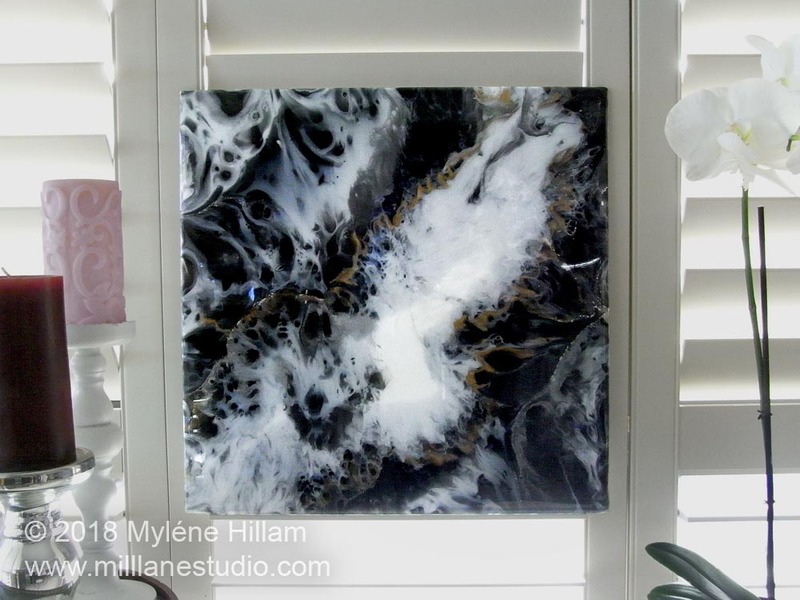 Drizzle the thickened silver resin along some of the edges where the black and white meet. You don't need to add too much, just to add some highlights. 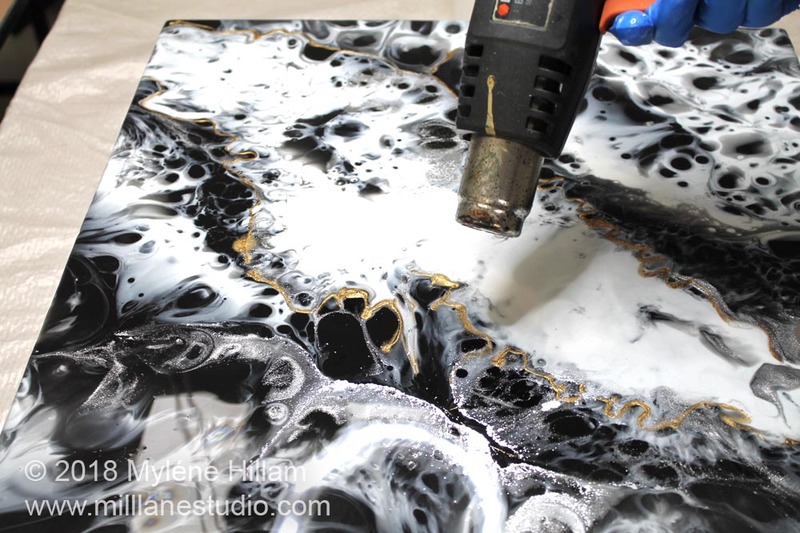 Use the heat gun to move the resin out towards the edges of the canvas. 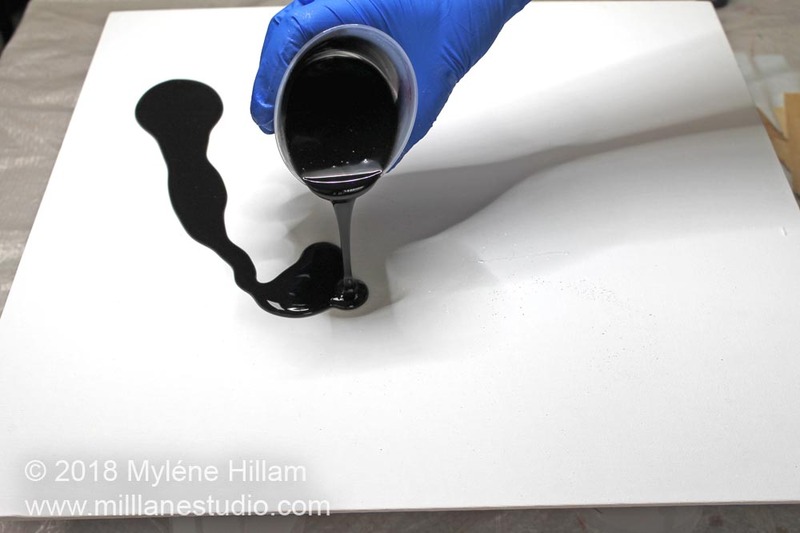 As the white resin moves across the surface of the black, even more cells will open up. Pushing the resin around is fun to do but it's easy to get carried away and you need to STOP!! If you overdo the heat gun, the colours will mix too much making the patterns overly busy. You really want to keep some solid bands of colour. If you still have gaps around the edges, pour more resin from the cups to fill them in. Drizzle some thickened gold resin wherever you would like gold highlights. 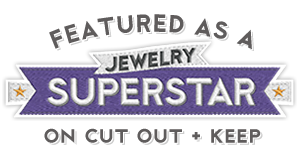 Use the heatgun to soften and spread out the gold a little. Keep the heatgun moving at all times and take care not to over heat or burn the resin. 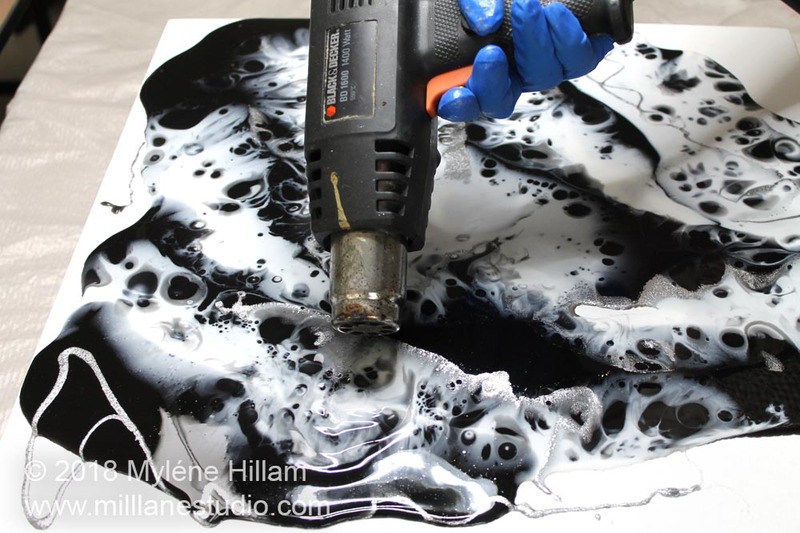 Brush the sides of the canvas with the resin that has fallen onto the dropsheet. 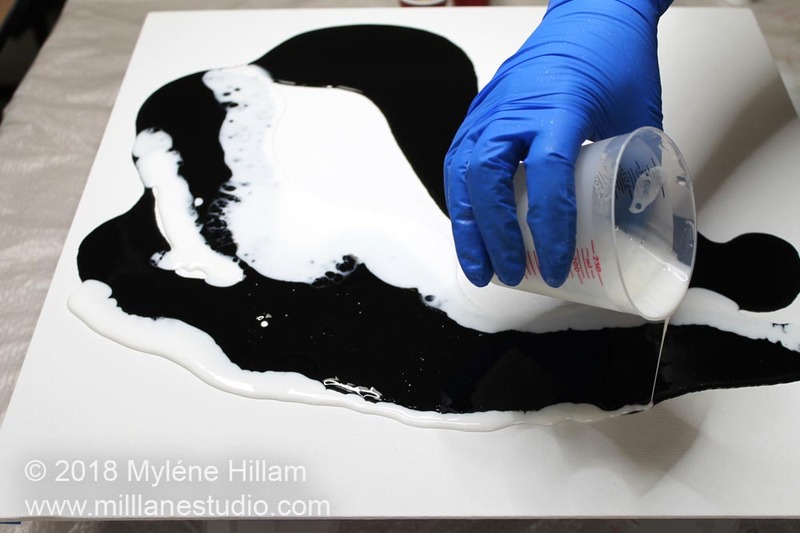 Now your canvas is finished... but the resin will keep moving until it reaches gel stage. Once you're happy with how the canvas looks, pass the butane torch across the canvas to pop any bubbles. You may need to do this again a couple of hours later. Leave the canvas to cure overnight. Clean off any residue from the dispersion media thoroughly with a soft, dry cloth. 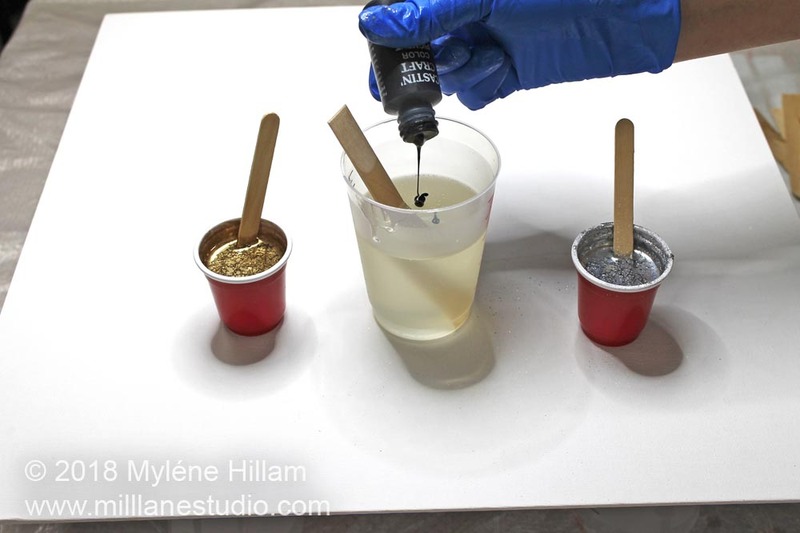 If any silicone oil remains on the surface of the resin, it will repel the resin top coat. Mix approximately 375mls (12oz) of EnviroTex Lite (do this in two batches) and pour it across the art panel. Pop the bubbles and leave the resin to cure 24 hours. Now that you've removed the tape, go ahead and hang your masterpiece.